The first race of the Isle of Man TT is tomorrow. The Superbike race will be 6 laps and is scheduled for 2pm local time. There is an 8hr difference to the US west coast and 5hr difference to the US east coast.If you fancy an early morning cup of coffee and some racing, there are ways to listen live. Let me give you some important links and a very brief run down of what will be happening. Listen live on www.manxradio.com or use the official app. Warning, it is plagued with problems every year. I never use it personally. The schedule for the week is here. The TT’s official youtube channel is a good place to find post-race press conferences. If you get Velocity Channel, they run 1-hour specials at the end of the week summarizing the races, but with editing that makes it feel live. Check your listings. Now, let’s briefly talk about the story so far. Fans already know that TT legend John McGuiness is out after a big accident in the Northwest 200. His teammate, Guy Martin, is the sole remaining rider on the Honda team, but he is struggling down the order; this is his first TT after years off. He is still a fan favorite though, drawing a crowd wherever he goes. Up front, qualifying has been all over the map. 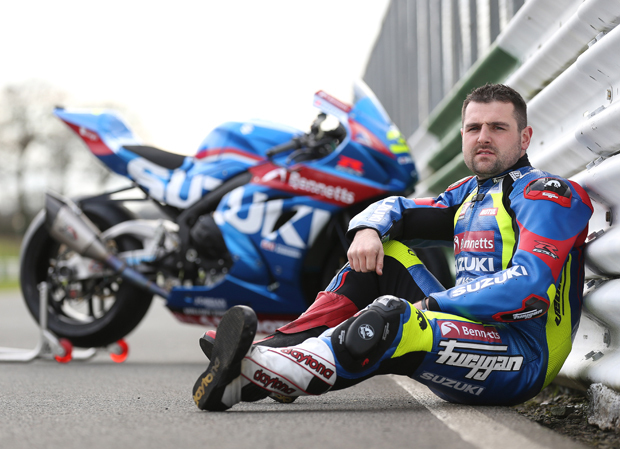 Ian Hutchison ran fast early in the week (on his Superstock bike no less) but Michael Dunlop is on the top of the charts as of today, with a 131.061mph average from a standing start. With 6-laps on a 37.73 mile course, there is no telling who will have the better strategy, who will have the better pit stop, or if set-up changes overnight might give someone an edge. The field is also stacked closely. Bruce Anstey, Michael Rutter, Peter Hickman, and Dan Kneen were all running 130mph laps during qualifying. It appears to be Michael Dunlop’s race to lose, but the Isle of Man is legendary for not following the script. Outside the top of the order, be sure to watch the Norton team. They are using the SG6, powered by Aprilia’s race-spec V4. Certainly the loudest thing on the Island, the bike is unmistakable with its reflective color scheme and distinctive roar. BSB star Josh Brookes has the controls of one bike. Brookes has been away from the TT since 2014, when he finished a stunning 7th place in the Senior TT. The other Norton is piloted by the fastest Aussie at the TT, David Johnson, who has a best finish of 4th and a fastest lap of 131. The Norton race team is really a labor of love, with a small team using a limited budget and little track time to just get out and race. They do it with style. Speaking of style, you can also follow Ben Wylie on the sole Bimota in the field. This is a semi-official effort from the small company, using the Bimota BB3. The bike is powered by the BMW S1000RR engine that has been a popular choice for the TT these last few years. Following Sunday’s race will be Monday’s running of the Junior TT for the 600cc machines along with the first of two sidecar races. Speeds for the sidecars have pushed toward the records, with the team of Ben and Tom Birchall missing their own 2014 outright sidecar record of 116.798mph by a whisker during qualifying. This time was just put in today, after a series of already fast 114mph laps have been seen by all the top teams. Dave Molyneux, who led practice sessions earlier this week, did not run today, leaving a question mark on whether the winningest sidecar driver in TT history will be able to answer the Birchall brothers’ speed come Monday. John Holden managed to answer with 115mph lap, but that equals a full 20-seconds time difference. The race will be four laps though, and a lot can happen in a class that’s well known for electrical gremlins and engine failures.